A fitted bedspread creates a tailored look that adds sophistication to your bedroom decor. You can find a bedspread design to fit any bedroom style. Many companies offer customized options for greater fabric choices. There are two main types and both designs offer an uncompromising look for your bed. Not many online shops or brick and mortar stores carry a large selection of this bedspread style. A fitted option is considered a more formal choice than a typical bedspread. The tailored bedspread features side flaps that are usually sewn together. It is possible to find this bedspread in all sizes, including twin, full, queen and king. It slips easily over the foot of the mattress. Most people select this type of bedspread for a striking decorative addition to their bedroom. You can find ready-made fitted bedspreads, but you may decide on a customized option, depending on your decor and personal style. Some tailored selections offer loose flaps ideal for a poster bed. The flaps hang neatly on either side of the post, for that tailored look. This makes it easy to remove from the mattress. Some designs use buttons along the flaps while others feature romantic bows. Ruffled options often feature split corners ideal for poster beds. An elasticized fitted bedspread features four elasticized corners that fit snuggly over the mattress the same way a fitted sheet is secured. All four corners of the bedspread have elastic sewn into the hem, so the cover simply slips over the corners of the mattress. The sides of the bedspread then fall snuggly against the sides of the mattress. This design often has to be a customized order. This style of bedspread is a great design choice for a modern or contemporary bedroom decor. A platform bed will look sleek and elegant with this style. Finding bedspreads online reveals a wealth of choices for your bedroom décor. You can find some outstanding choices at Touch of Class. One of the largest range of bedspreads on the Internet, the choices include twin, full, queen, king, California king, and daybed sizes. Simple quilted solid-colored options feature a traditional look. 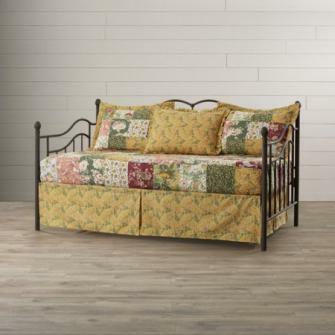 Many of the bedspreads offer truly elegant enhancements like the Blossom Floral Quilt set for a daybed. This set comes with a pair of matching shams. Other decorative pillows are available along with curtains and two valance choices. An example of a specific design theme is the Southwest Frontier Fitted Grande that's available in full/double, queen and California king sizes. Accessories, such as pillow shams, decorative throw pillows, curtains and a valance are also available. Other design examples include floral and damask. Some bedspreads offer free shipping. Other items' shipping charges are $7 to $22, depending on order amount. Orders over $200 shipping fees calculated at 10% of order. Bedspread pricing ranges from around $140 to $300. Bluestem Brands has 11 brands with various offerings; you can shop several of their stores for bedspreads and check out from them at the same time. For example, one offering from Blair features a traditional quilted top design with split corners and fabric inserts. Face is 100% polyester micro fiber with 100% polyester fill. Twin, full, queen and king sizes are available. Colors include linen, merlot, orchid haze, Pacific blue and sage. Expect to pay about $40. Classic diamond quilting pattern give this bedspread a traditional appeal. Split corners are secured with ivory colored ties. 26" drop hem ensures deep mattresses are aptly covered. Sizes available include twin, full, queen and king. You'll pay between $160 and $210. Both Linen Source and Blair have shipping rates from $7 to $22, depending on order amount, within the continental U.S. and additional fees for shipping to Alaska and Hawaii. This set costs around $70. Shipping is free or you can select in-store pickup. Buttons at the two foot corners open fully when needed. A 24" drop from the edge of the bed ensures adequate coverage for deep pocket mattresses. The regular price is around $350. Shipping is free for orders over $99. Nearly anything can be found online at Amazon - including fitted bedspreads. While a ruffled choice is often the pick for a girl's room, it can also be appropriate for an adult's room decor, especially when designing a romantic style. 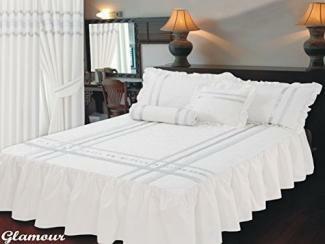 Amazon features a glamorous white quilted and ruffled bedspread with silver trim and ribbons. The bedspread is advertised as "Super King size" with measurements of of 180cm (70.87") x 200cm (78.74"). Deep mattress pockets are accommodated with a 22" drop. It costs less than $200 and shipping runs about $5 for the spread. If you opt for a customized product, Calico offers many options to guarantee you end up with your ideal bedspread. The website boasts that it has, "10,000 designer fabrics and thousands of trims from the finest mills around the world." The store is a full design service, selling furniture, upholster, The first step is to locate a store near you. The website walks you through the process. The company offers free in-home or in-store design consultations. You will complete a contact form and then submit through your local store's website. There is an option on the contact form for you to upload images in .jpg, .jpeg, .png and .gif. You can also include a note. When shopping for bedspreads, it's important to consider the type of lifestyle you enjoy. If your style is carefree and informal, a fitted bedspread might not fit your decor and lifestyle. Casual living might mean simply having a bedspread you can toss over the bed each morning. 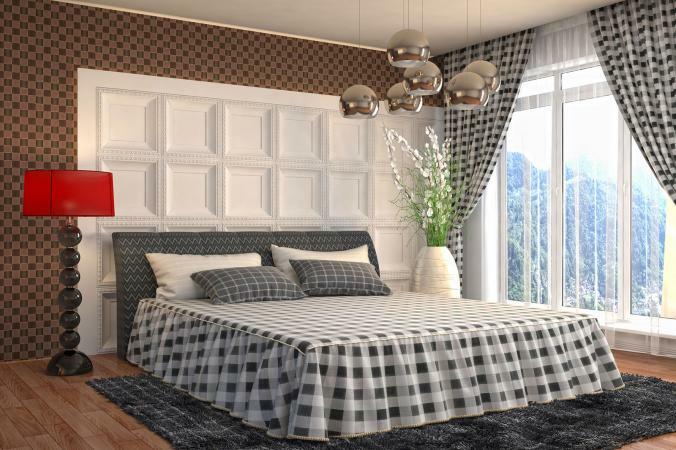 If you seek a classic look that is always neat and orderly, then a fitted bedspread is a must for your bedroom decor. Fitted bedspreads can be used for country/cottage styles, modern/contemporary, and traditional/classic designs. You can always order a customized bedspread to personalize your bedroom design. Sizes are typically the same for any other type of bedspread. Pay close attention to the "drop" length and measure the drop of your bed (from edge of mattress to floor) so you know what the coverage will be. Standard drop is 21", although higher beds may require a longer drop. You'll find plenty to love about this style of bedspread. A tailored bedspread provides a neat and always perfect look to a made bed. If you have a four poster bed, you'll find split corner options ideal. The fitted style adds a hint of style regardless of your room's design scheme. Kids (and adults) will find making their beds easier, as they don't need to tug and pull to get the spread laid evenly. Even if you love the fitted look, there are a few downsides to choosing this style. Customized elasticized options are purely for decorative purposes. They are removed when the bed is in use. This means an additional blanket, coverlet, comforter or bedspread might be needed to provide needed warmth. Ruffled bedspreads may need the addition of bed skirt if the mattress is too high off of the floor to give the optimum look. If you like having a loosely fitting bedspread, you may find sleeping underneath a tailored bedspread confining, especially for legs and feet. If ordering a customized bedspread, be sure to measure accurately, since you won't be able to return it for a refund. Select the type of fitted bedspread that best suits your style. A bedspread that evokes a touch of elegance may be the final touch you've been looking for to pull your bedroom design together. Nothing says retreat, rest and relax better than the neat clean look this style of bedspread gives any bedroom.